It was a long weekend when Holi coincided on a Friday. I quickly planned a trip to Aurangabad. Three days is all I had and it was sufficient time to explore Aurangabad (strictly from a corporate slave perspective). Aurangabad is great for history lovers. There are caves, forts, Mughal architecture and traces of Buddhism. The best part about Aurangabad is that it’s conveniently accessible from major metros like Mumbai and Pune. I’m sharing my itinerary here so you can take ideas to explore Aurangabad, which you definitely must! As a corporate slave, pressed for time, this itinerary is compact without being hectic. We arrived to a shut down city on the day of Holi. Number of stone gates in Aurangabad quickly caught my attention. Aurangabad is called the city of gates with over 12 such gates like Dilli Gate and Paithan Gate to name a few. 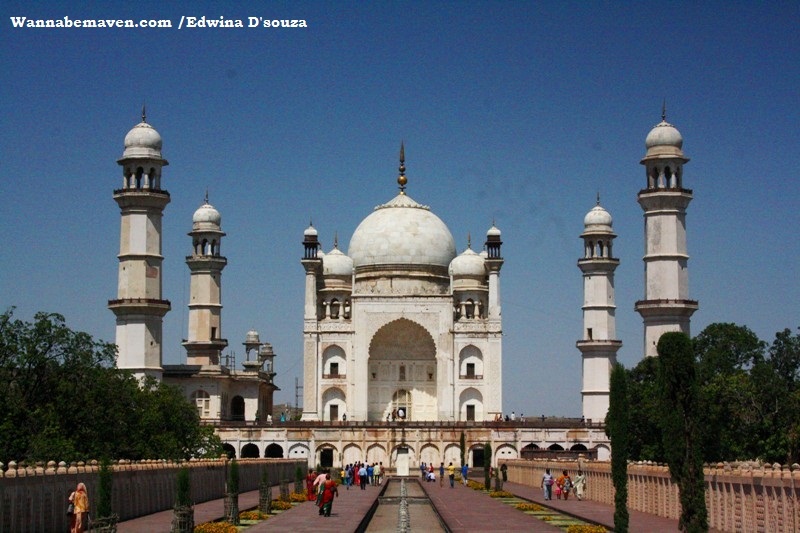 On arriving in the city, we drove straight towards our first stop – Bibi-Ka-Maqbara. 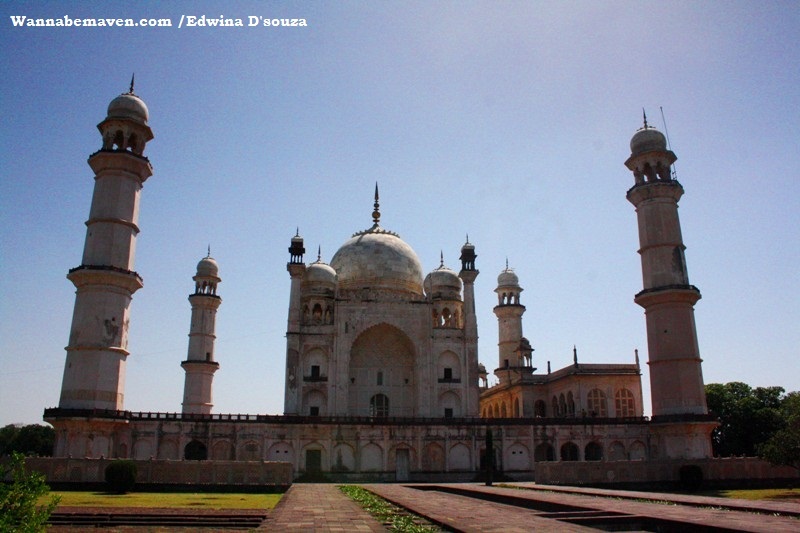 Bibi-Ka-Maqbara is called the Taj of the Deccan. People also refer to it as the poor man’s Taj for obvious reasons. The monument was commissioned by Shahjehan’s son – Aurangzeb. However, it was built between 1651 and 1661 AD by Prince Azam Shah (Aurangzeb’s son). Bibi-Ka-Maqbara is a mausoleum in memory of Rabia-ul-Durrani Alias Dilras Ban Begum – Aurangzeb’s wife and Azam Shah’s mother. Believe it or not, I am yet to visit the Taj Mahal in Agra. So, I had a childlike enthusiasm to go visit its replica. Having not seen the Taj Mahal in Agra helped because that way I wasn’t drawing resemblances to the original. And honestly, I was quite in awe of the structure. If anything, Bibi-Ka-Maqbara has now inspired me to go visit the original monument of love built by Shahjehan for his wife Mumtaz. (Note: I visited the Taj Mahal in Agra in August 2015). Entry to Bibi-Ka-Maqbara is a meager sum of Rs. 5 for Indians. Foreigners shell out Rs. 100. Timings: 6am to 10pm. The entrance gate at Bibi-Ka-Maqbara had a board directing towards Aurangabad Caves. These caves were not on my itinerary but since it was close by we decided to give it a go. As we drove towards the caves, the location got remote. It was, in fact, secluded during our visit, so we returned without entering the caves. It wasn’t a bad idea going all the away to the footsteps of the caves though, since I managed to get a spectacular view of Aurangabad city from the hill. Next, we stopped at Panchakki – a structure that gets its name from a watermill that grinded flour using water power. 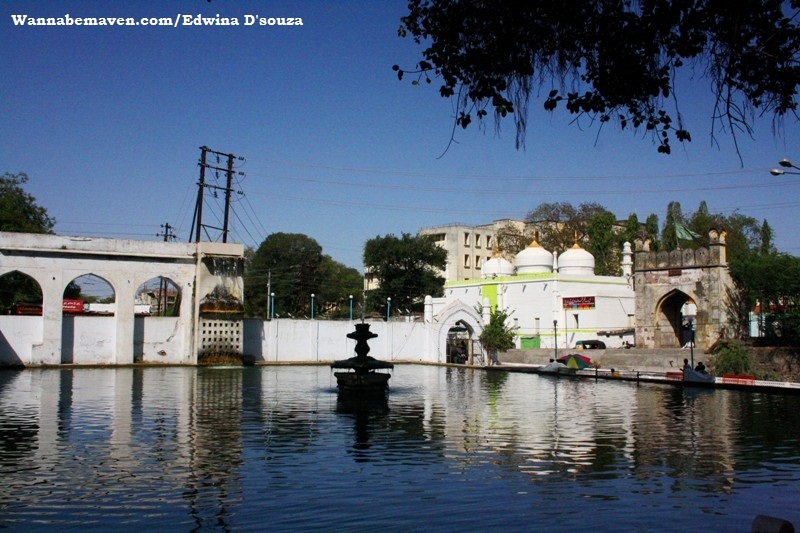 It was built in 1624 to commemorate a Muslim saint and Aurangzeb’s spiritual teacher – Baba Shah Muzaffar. Highlight of Panchakki is its simplistic yet brilliant engineering. Its underground clay pipes go up to a distance of 11kilometers and circulate water around Aurangabad city. A shrine has been built here for the saint and there are some shops and eateries around the corner along with a small museum that was unfortunately closed during our visit (maybe, Holi was to blame). There isn’t much to see or explore at Panchakki, so you can move out from here in about half an hour. 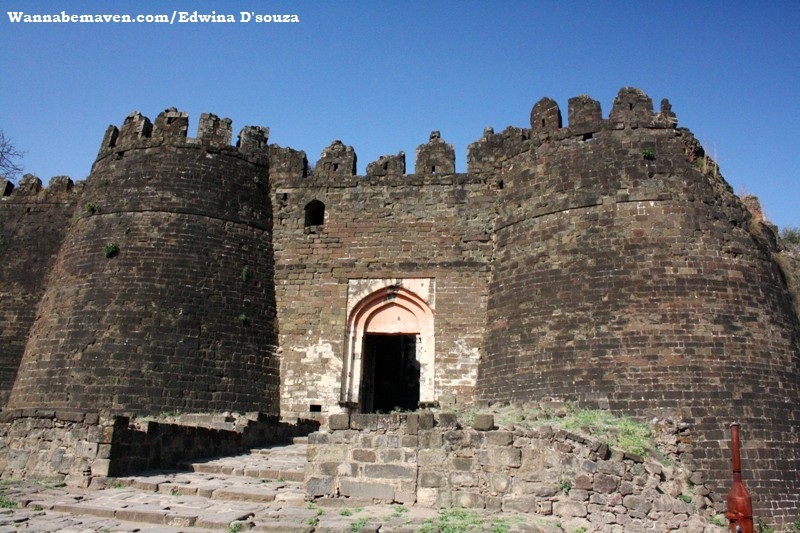 At 3:30pm, we were at Daulatabad Fort, originally the fortress of Deogiri. Daulatabad Fort gained wide attention as the ruling fort of Mohammed bin Tughlaq. His decision to shift the capital from Delhi to Daulatabad gathered a lot of criticism. Following which, he re-shifted the capital back to Delhi. A palace at the hilltop offers a panoramic view of Daulatabad but getting there is a trek in itself. What makes the climb thrilling though, are the Andheri (dark) passages that were designed to mislead enemies. Some of these dark passages are still open for visitors which make for a fun climb (don’t forget to carry a torch). Tip: Give yourself a minimum of 2 to 3 hours at this fort since it’s really massive. Visitor entry is restricted after 5pm. 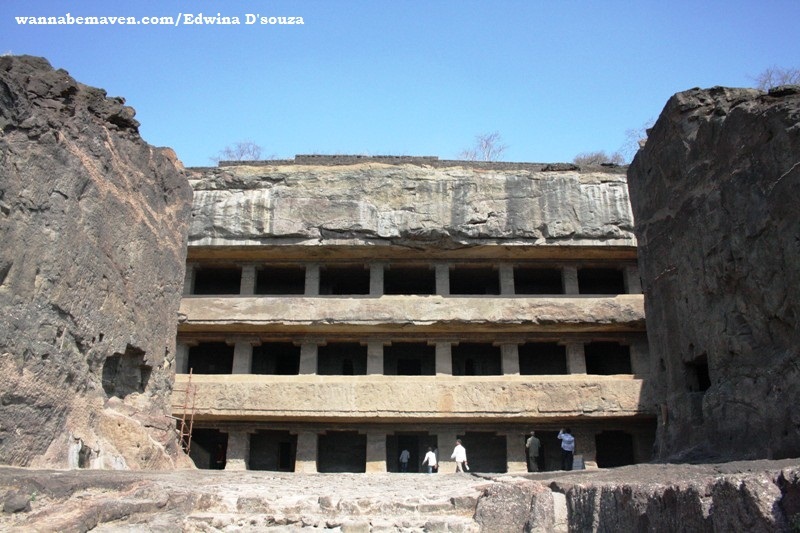 We kept the entire day for Ajanta Caves – 110 km away and almost a two and half hour drive from Aurangabad city. 80% of the journey had bumpy roads, leaving us with a disappointing feeling since the caves are an international tourist site with UNESCO World Heritage status. 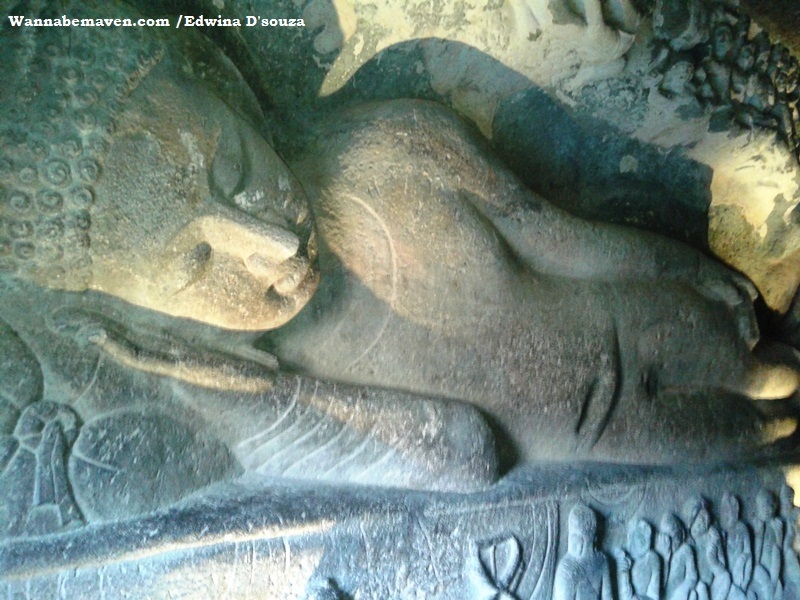 Ajanta Caves consist mostly of Buddhist sculptures. Highlights are the intricate paintings on the walls depicting stories from Jataka tales drawing connection to Buddhism. There are 26 caves here, although not all of them are of importance. Be sure to visit cave no. 1, 2, 16, 17, 19 and 26. Private vehicles have to be parked at the base of Ajanta Caves complex. 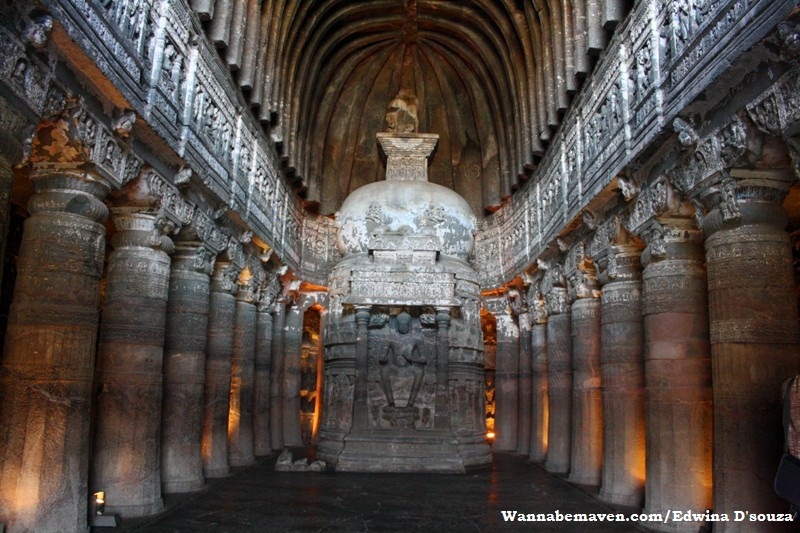 Thereon, you are required to take the 30 minute drive government tourist transport to Ajanta Caves. Buses run every 15-20 minutes. Entry charge for Ajanta Caves was Rs. 10 per person along with an additional Rs. 5 for the special lighting inside some of the caves to illuminate the wall paintings. Apart from government approved guides, each cave has a caretaker that can double up as a guide to take you through the history of that cave. His not so subtle hints will compel you to tip, though. We wrapped up our trip to Ajanta Caves by 4:30pm and were back in Aurangabad city by 7pm. Early morning, we headed towards Ellora Caves. En route, we made a quick stop at Khuldabad to visit the Tomb of Emperor Aurangzeb. We were amazed at the simplicity of the tomb unlike the grandeur at Bibi-Ka-Maqbara that housed the tomb of his wife. 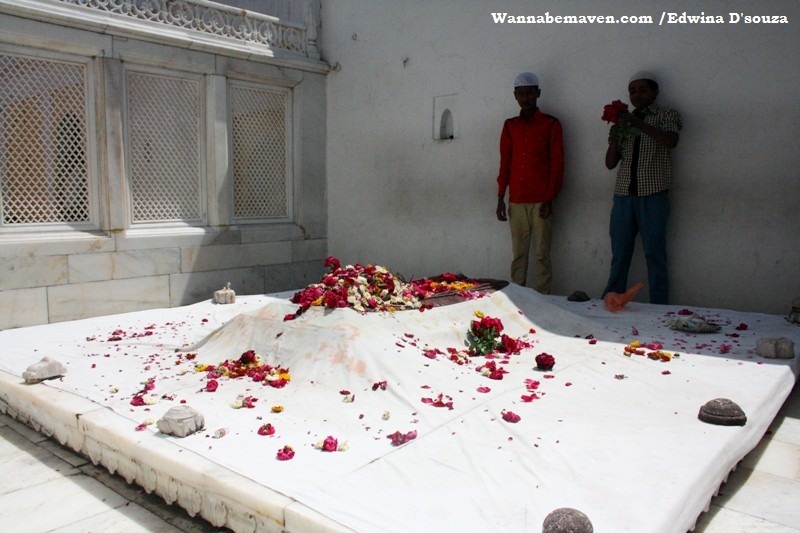 It was Aurangzeb’s last wish to keep his tomb simple without an ounce of extravagance. Aurangzeb’s Tomb adjoins a dargah. There isn’t much to see here, so this is a quick 10 min stop and back on your onward journey towards Ellora Caves. 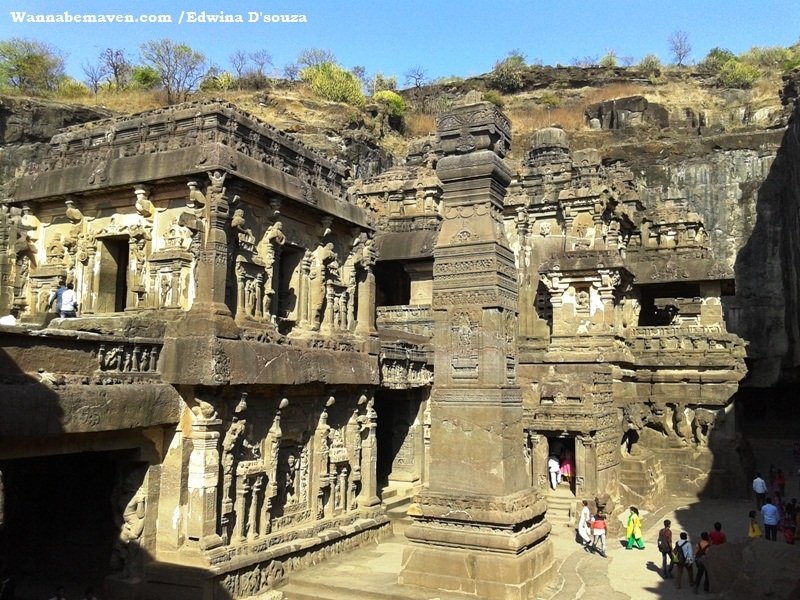 Ellora Caves is another UNESCO World Heritage Site monument and an integral part of your Aurangabad trip. These caves have Hinduism, Jainism and strong Buddhist influence. 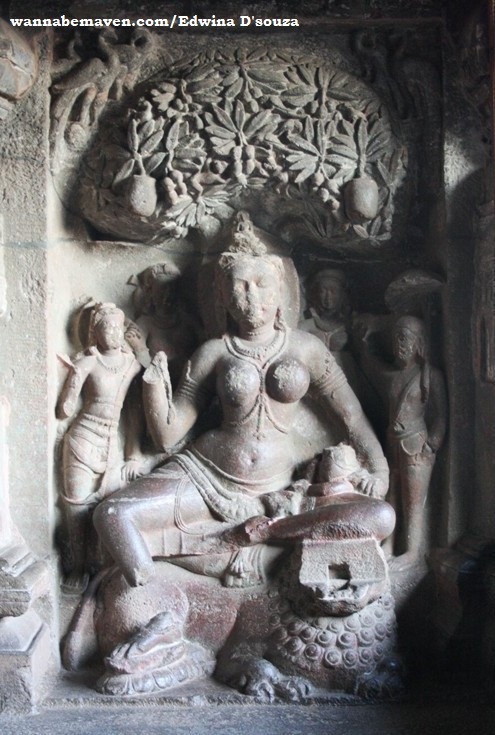 There are a total of 34 caves at Ellora, but only a handful is awe inspiring. Others have not been able to withstand the test of time. Cave no. 5, 10, 12, 21 22, 29 and 32 are worth visiting. But you must most definitely check out cave number 16. 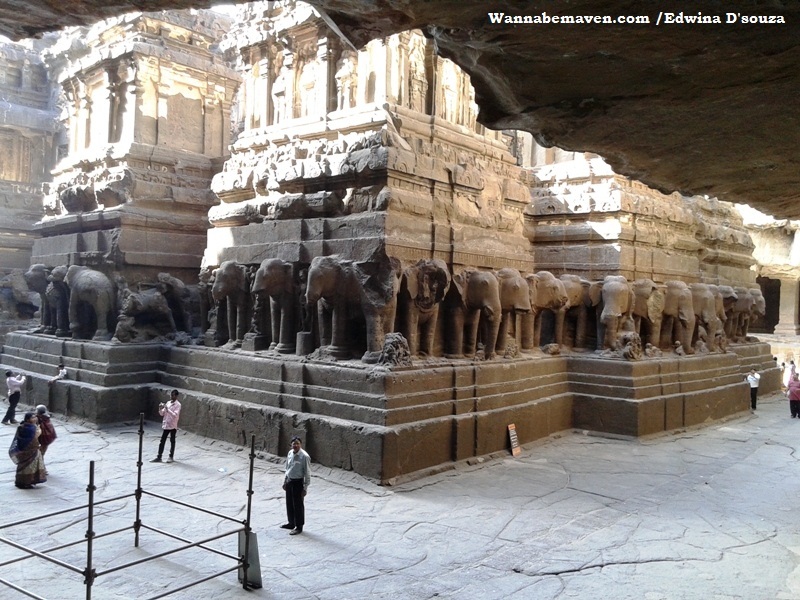 This is the best cave at Ellora and also the world’s biggest caved Kailash Temple. Tickets cost Rs. 10 per head. Visitors are required to move out from the site by 6:30pm. At 4pm, we left from Ellora Caves and bid good bye to Aurangabad for Mumbai. By 11pm, we were back in Mumbai for a good night sleep – all prepared to head back to work monotony. I was unable to find any food local to Aurangabad. Every other restaurant served standard mughlai, biryanis, tandoori and tikkas. Definitely Aurangabad is not on my list of places to travel for food. Stick to mughlai cuisine since Mughal influence is strong in this region and the city has a good Muslim population. 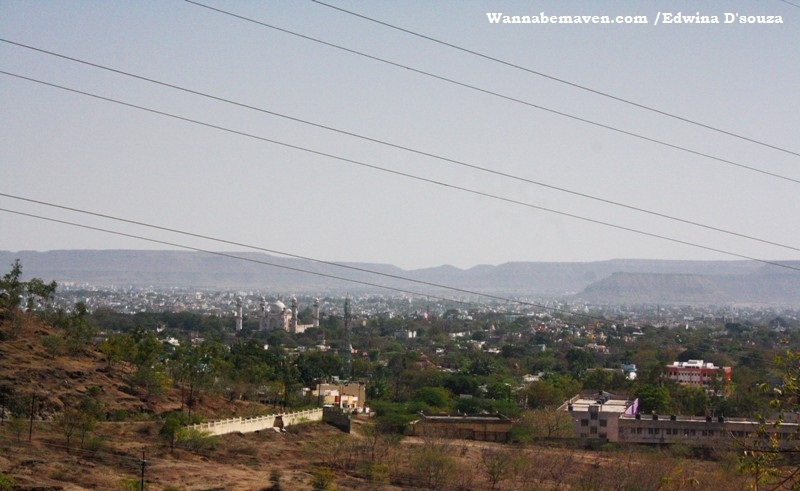 Aurangabad is known for Himroo sarees and shawls. Paithani sarees from Paithan are also quite popular in Aurangabad. 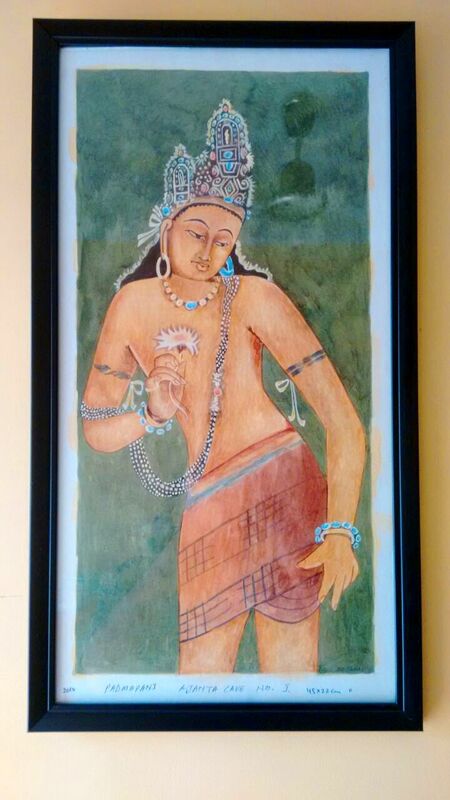 We picked up a replica painting of Bodhisattva Padmapani – a very popular wall painting at Ajanta Caves. Aurangabad is a tourist destination and an emerging business center, so accommodation is easy to find. Traveling to Ajanta and Ellora can be day trips. It would be a good idea to stay near the railway station since activity bustles here. Stay choices around the station are plenty and you’ll find agents literally poaching customers with steal deals. We kept our budget tight and stayed in a family run lodge near Aurangabad station that cost Rs. 700 for a non-ac room with extra bed that squeezed in 3 of us. For Rs.1000 to 1200 a night, you’ll easily get a good hotel room. Holi, they say, marks the beginning of Indian summers and right they are! The weather was dry and extremely hot during our visit. I’m not sure if monsoons are a good time to visit Aurangabad as well, since most of the attractions are mountainous caves and these don’t exactly translate to safe tourist getaways during monsoons (Although I’m sure they promise amazing views). Winters are the best time to visit. That would be from October to February. We did a road trip from Mumbai covering around 360 km. Having started at 7am, we were comfortably within Aurangabad city limits for lunch. There are two ways to reach Aurangabad. First via Nasik and the second via Ahmednagar. The latter option is better for those residing in Pune. If you’re from Mumbai, traveling via Nasik is quicker and a shorter distance. Aurangabad is a major train station with connectivity to over 30 interstate trains. The city has an airport around 10kms from station road. Daulatabad Fort can be done two ways. Either on Day 1, after Bibi-Ka-Maqbara and Panchakki; however, by the time you reach Daulatabad Fort, the afternoon heat is unbearable. The other option would be to visit it early morning on Day 3, so the heat won’t be unbearable. But you might have to compromise on time given to Ellora Caves. Guide facilities at tourist locations across Aurangabad are overtly priced banking on the government approved tag. For a minimum of 5 people per group, guide charges go beyond 1000Rs, which only sounds reasonable if expenses are split. Ajanta Caves are closed on Monday and Ellora Caves are closed on Tuesday. (Note: All prices were correct at the time of publishing this blog). Architecture, Art, Aurangabad, Budget Travel, cave, Heritage, History, Indian tourist destinations, Road Trip, Short Trips from Mumbai, Tourist Destination, UNESCO World Heritage. Bookmark. Enjoyed reading your blog. precise n concise,gave an excellent overview for plg an Aurangabad trip. Any inputs on the road condition if driving from Mumbai. Thanks for the detail information. I am planning to start from Pune at 5.00 am to cover Grishneshwar, Ellora and Daulatabad fort then continue till Shegaon for night stay. Is it possible to cover all these in a day? 2nd day visit will be Shri Gajanan Maharaj Temple, Anand Sagar and stay there only. 3rd day early morning will leave for pune visiting Lonar Crater on route and some local sight visit in Aurangabad. Please reply with your valuable comments for this plan. I found your write-up very helpful as i am planning to viist with my daughter (age12) after her exams. Maybe in 1st week of May. is this safe place for women ? we will be travelling 1st time all alone. Thank you for your write-up. I am going tomorrow and I can plan my travel better now. Hi, thanks for the detailed information.. Thank you for such an elaborate plan. You have all the necessary information I was looking for. Hey. You’ve got a wonderful blog. I wonder how it didn’t show up in many of my Google searches for a good travel blog. About Aurangabad food I’d like to add. One needs to know some places for authentic food here apart from Mughal food. Typical black gravy of Marathwada is addicting and spicy which is difficult to find in Pune or Mumbai. Somewhat similar to Nagpur food but still different. I am from Kolkata, I am planning a trip to Shirdi and Aurangabad this October, your blog is very helpful to me as I have no idea how to workout the itineary. Could you also suggest any other places that we can cover in our trip? Thanks Arundhuti. You can also check out the Lonar crater as a day trip from Aurangabad. It’s just 140km away. Came upon your excellent blog when I did a google search. So glad I found this – you gave exactly the information I was looking for. Love your writing style and your enthusiasm. Hope to visit your page often and read your latest adventures.